The first Sunday of April, on my way to church, it was clearly visible that the front door of the Brown House had been kicked in. It was devastating to see. 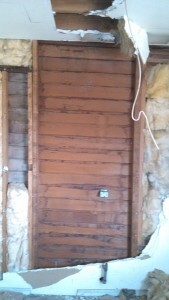 That beautiful hardwood door was one of the gems of the house. It was heartbreaking to think about what was waiting for us when we got to the house to survey and damage and secure the entrance. With ladder, hammer, nails, and extra wood George and I met at the site. I was able to put a quick Facebook post out for others to join us but it was really such short notice that I didn’t expect the Calvary. I had never been inside the house and had only imagined what damage had been done to the interior of the unattended to house. This was my opportunity to actually see the interior and assess for myself the potential that I believed the house held. The potential that both of the developers of its original location and the current location of the house, the Riverside Supervisors, and community members saw over 10 years ago was clearly no longer visible on the outside. However, upon the first steps on broken glass inside the building you could see that the house is doing well. It has really held up well and as I suspected has good bones to work with. The house was totally gutted to move it. There are no kitchen cabinets or fixtures, no bathroom fixtures; it was taken down to the bare bones. The rooms are bare and fairly large. You could see where the fireplace had been and there were some old bricks that were saved lying across the room. The living room is spacious with beautiful parkway flooring that really is in surprisingly great shape. The house is spacious with high ceilings and the walls are textured thick plaster, although it’s not intact because vandals had at some point torn into the walls to look for anything of value such as copper wiring. You could see some knob and tube electrical that hadn’t been stripped. Over the years the house has seen its share of visitors who really didn’t have preservation on their mind. All of the glass is broken. I didn’t see a single window pane that was intact. Walls have been kicked in and torn down. Anything of value that was left in the house would have been carted off. The floor is uneven from years of balancing on the steel beams. But, if you look beyond the surface you see the shiplap that is beneath the surface. There was a piece of ceiling dry wall that had come down and revealed beautiful craftsmanship of the tongue and groove hardwood that still looked watertight. Ceiling view, beneath the drywall. 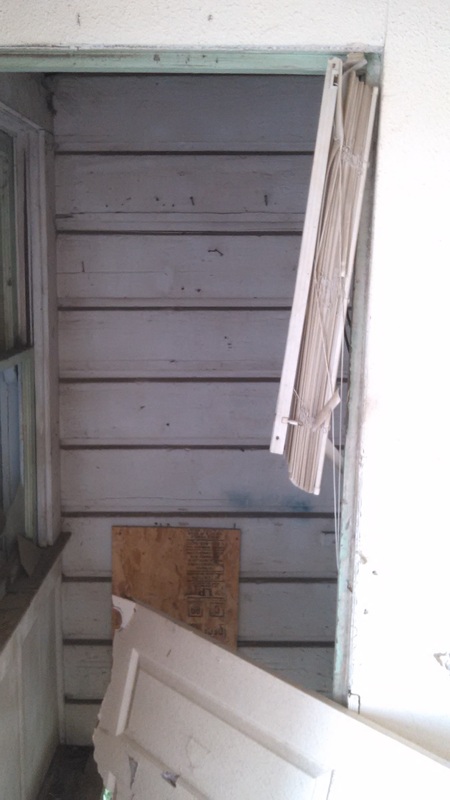 Shiplap exterior that is inside one of the porches, and interior wall. To tell you the truth, I should have never gone in. Now all I can see is potential. With walls taken down and supporting beams put in for an open concept for community space the possibilities are endless. I can see an area for educational exhibits, displays for historical resources, a visitor center, and a common area to hold community events. The developer and the Wildomar Historical Society are working on getting a true assessment by professionals done by the end of the month. It is the intention of the Strata Group to go before Planning Commission in May to start approvals for the slated project. We all need to know the real potential of the house. I think last year we were able to raise about 12% of the cost of the assessment. 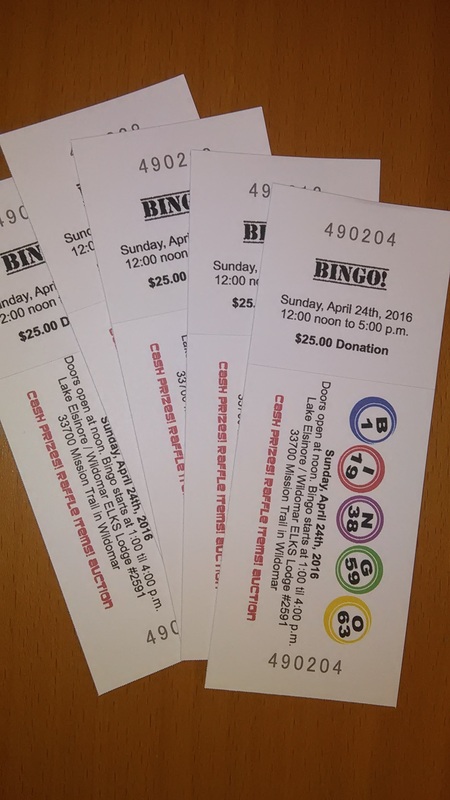 We have a Bingo event at the Elks planned for Sunday, April 24th, 2016 from 12-4 with hopes to cover the majority of the cost with some cost sharing possibility with the developer. p.s. 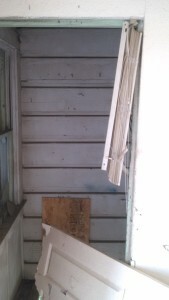 There was access where the fireplace was, a back window, and the front door were all secured. The weeds around the building were abated on Monday the 11th. 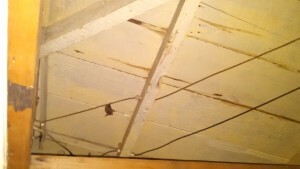 We are looking to plan a clean-up day in May to remove the debris of the broken glass, boards, and insulation. We will have teams of 8-10 for two to three hours throughout the day to help. 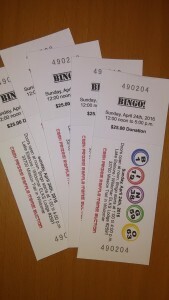 This would be a great opportunity for you to see the potential for yourself. So get your work boot and gloves ready. More information to follow.